For being such a simple mixture (in its most basic form, chickpeas, tahini, lemon juice and garlic), hummus has quite the hold. Not only do I always have a tub in my fridge for easy/healthy snacking/dunking purposes, but a trip through the refrigerated section at the grocery store has me checking out with at least five new flavors. Luckily, hummus is good for more than just pita chip-scooping and can be incorporated into just about every meal of the day. Here are 4 new ways to use hummus that go beyond your standard chips-and-dip snack. Use hummus in place of mayo on sandwiches, burgers, and wraps. No one likes eating a dry sandwich, but sometimes you want something a little bit more nutritious than a thick smear of mayo on your bread. 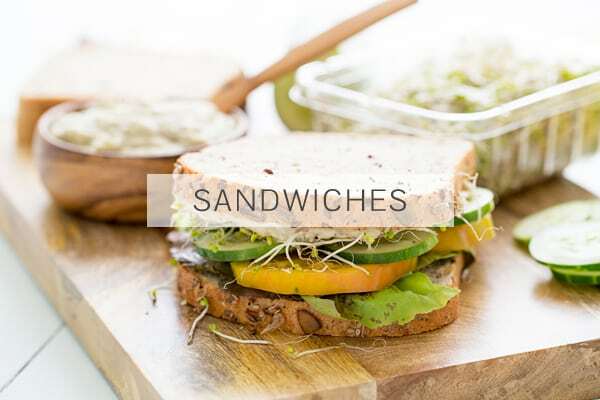 Hummus, which is chock-full of protein from all the chickpeas that go into it, is a great alternative to many of these more conventional sandwich spreads. Plus, there are so many flavors out there that you can mix and match them with your sandwich fillings. Even if the base ingredients stay the same, it feels like you’re eating a different sandwich every time. Variety is the spice of life, after all! Use hummus as a topping for grilled or roasted veggies. I love roasting or grilling up a big pan of veggies no matter what the season is. Though they always taste great with just a sprinkling of salt and pepper, a drizzle of hummus goes a long way in making them even more delectable. You can thin down the hummus with a bit of water (or tahini) so that it has more of a saucy consistency and toss it together with your veggies so that it coats them all evenly. In these roasted root veggie tacos, I’ve just smeared it as-is all over my taco shells before piling my roasted veggies on top. 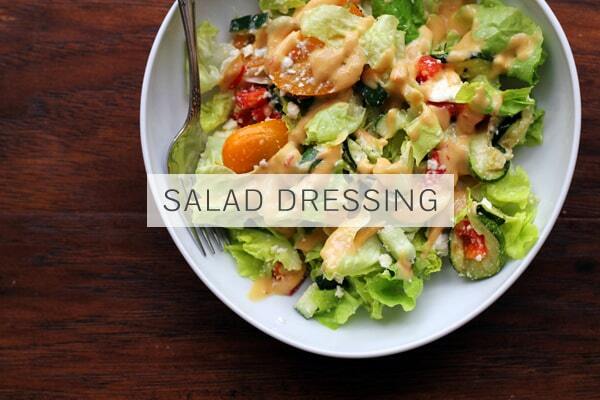 Use hummus as a salad dressing. You really haven’t lived until you’ve turned your favorite hummus flavor into a salad dressing. All it takes is a quick whisk of a 10-ounce tub of hummus with 1/3 cup of olive oil, 3 tablespoons of white wine vinegar and 1 tablespoon of sesame oil, and all of a sudden you have enough hummus dressing to smother at least two weeks’ worth of salads. This dressing is the perfect blend of creamy and vinegary, resulting in that satisfying mouthfeel we all know and crave without a heavy taste. I especially love it drizzled over a Greek salad, but suspect that it will play well with most salad mix-ins. This post was originally published on August 5, 2014. I use red pepper or garlic hummus for pizza sauce all the time. It gives a nice contrast and kick depending on the flavor. Yum! Having so many different flavors of hummus out there, definitely makes it more fun to mix it up! Wow, what another great idea. Pizza sauce. There’s nothing like making a pizza yourself. Hummus on everything! I love it as a pizza topping, dip/sandwich spread and on a dinner “bowl” but really need to get on the salad dressing thing! Hummus is the only thing I use as a salad dressing! Love it! I think it might be the only thing I’ll use from here on out! Hummus for me, hummus for you, hummus for everyone. Still in love with the salad dressing idea! Hummus for the world! Thanks, chica! I’m definitely going to have to try those taquitos ASAP! Thanks for sharing! I love hummus on sandwiches! It really does make for such a great sandwich spread, doesn’t it?! 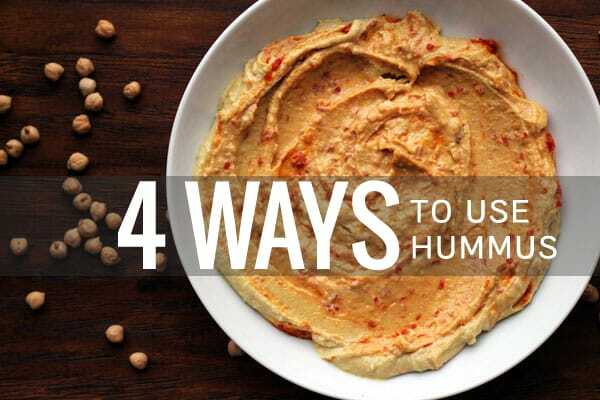 I’ve yet to meet a way to eat hummus that I didn’t like…so I’m sure you will love it! Hummus is my go-to sandwich spread! Same! Especially since I can’t stand most condiments (cough mayo and ketchup cough). I love hummus on everything. Recently I heard of combining it in burgers though I haven’t tried that yet! I haven’t tried that yet either, but I’ve also heard of it! Definitely report back if you give it a go. Hummus is one of my favorites. I put different things in it every week and use most of it on veggie sandwiches/wraps. Great idea to use it as a salad dressing, I’ll have to try that. Thanks! It really is great how hummus can take on so many different flavors and is so versatile! My favorite way to use hummus is to make deviled eggs with it! It gives it a great flavor and the filling still remains creamy 🙂 It’s also fun to use different types of hummus for this. Ooo I’ve never tried it that way! Definitely going on my must-make list. Never tried it on pizza, but sounds delightful! I love hummus with roast veggies! I like to stir hummus into plain pasta, with some veggies, and heat it up. It makes an awesome pasta sauce. For my work lunch, I will put some hummus at the bottom of a microwaveable bowl, add the pasta, then add some veggies. Then at work I microwave it and stir it all up. It comes out really good! !